I think we could do with a thread in this section for people to post photographs of buildings they are interested in but need more information about. For example, when you come across a building you want to identify but don't know what it is or what it has been. 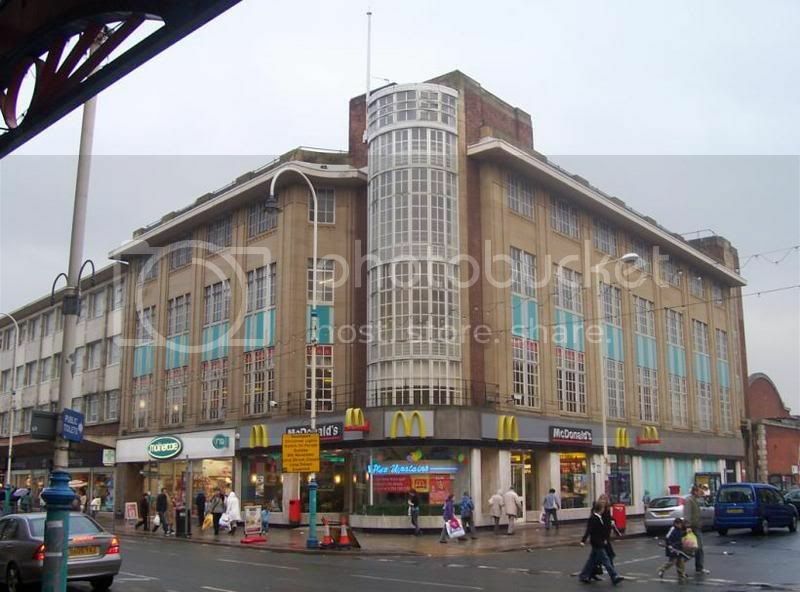 Does anyone know what the Southport McDonald's used to be? [QUOTE=Ross;29831]I think we could do with a thread in this section for people to post photographs of buildings they are interested in but need more information about. Southport Co-operative Society's Department Store. 1934, if I remember correctly. Last edited by PhilipG; 12-20-2006 at 01:29 AM. this is a really good idea for a thread. I am sure Philip will excel in this one!! Thank you, but Beacon House was too easy. I worked for Southport Co-Op for a few years in the early 1960s, and Beacon House was their H/O. BTW, I think that the Co-Ops across the country went in for interesting architecture. In Liverpool, for instance, they built places like Holyoake Hall in Smithdown Road (still there, & one of my fave Liverpool buildings). London Road is a great building, & I've tried to find out exactly who it was built for. My research at the moment is leaning towards Rubin's (drapers), who were at the site in 1937 (which is the date Joseph Sharples gives for the building). Not sure if this is the right thread for these - but since the Co-Op has been mentioned I'll stick 'em here! The Co op on Lawerence Road in Wavertree's a rip off. Another quick result. There are some knowledgeable people on this forum. I've been in the McDonalds a few times and often wondered who the building had been built for. It has that Theatre-ish look about it, I think. Anyway, here's a couple of pics from Summer and a couple of weeks ago (a row of derelict shops has been demolished inbetween the 2 pics, which allows a better view of the left-side of the building). A date of AD 1914 appears in the stonework. There was a dance-hall upstairs. do you know what this building is/was? It used to be a Bank of England bank - my folks used to work around there at one time. It was built in 1904 as the Bank of Liverpool. Taken over by Barclays Bank. It's been a Doctor's Surgery for at least 20 years. many thanks Philip! I knew you would know! It's a very nice building. I don't know what it was originally. The Car Phone Warehouse does nothing to enhance the frontage does it !! It wasn't a bank or a pub, because it would have been marked as such on the OS maps. Way back as far as the 1940s, it was an opticians (but it wasn't built as such). Kings the opticians still have part of the building. Until a couple of years ago they had all the ground floor. I thought the building might be Edwardian, but Joseph Sharples mentions it in passing (page 180) and says "possibly 1880s". There is a Liver Bird in one of the panels. Thank you for the info and welcomes everybody. P.S Who is Joseph Sharples? Joseph Sharples has written "Liverpool". One of the new "Pevsner Architectural Series". It gives details of all the Listed Buildings in Liverpool. The one you're interested in isn't Listed. Here it is in about 1890. The stucco decorations and new windows were put into this building in Edwardian times. We have got a few more buildings, just been on a little tour! We will post them in the next hour or so. P.S Where exactly was the Sailor's Home? We have just been on a little mystery tour, and saw this building in Cornwallis Street. I have just googled it, and found out it was a Public Baths...so I have kinda answered my own question! But still an impressive building! Last edited by MissInformed; 12-24-2006 at 01:27 PM. The sailors home was in Canning place on the west side. was it here? or am i barking up the wrong tree?